Newly released Batman film The Dark Knight Rises made an estimated $160 million at US and Canadian box offices in its opening weekend, a record for a non 3-D film. But the blockbuster’s takings were below industry forecasts made before the mass shooting at a midnight showing of the film in Colorado on Friday. Projected figures suggested the film would make an estimated $173 million, based on Friday receipts. Twelve people were killed and 58 hurt in the attack at a cinema in Aurora. The top two highest-ever openings were both 3-D films – The Avengers with $207 million and Harry Potter and the Deathly Hallows Part 2 with $169 million. “For this film (Dark Knight) to still be in the rarefied air of the top-three openings of all time is phenomenal, given the unfortunate circumstances surrounding the release of this film,” said Paul Dergarabedian, a box office analyst for Hollywood.com. Following the shooting, US cinemas tightened security and Warner Bros scaled down its promotional plans. A movie premiere in Paris was cancelled, along with personal appearances by the cast and crew in Japan and Mexico. “My heart aches and breaks for the lives taken and altered by this unfathomably senseless act,” Anne Hathaway said in a statement. 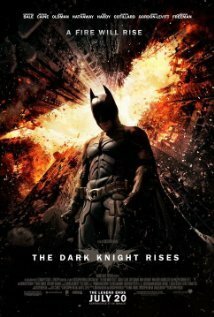 The third and final film in director Christopher Nolan’s Batman series stars Christian Bale and Anne Hathaway. It cost Warner Bros $250 million to make. Studios including Sony, Fox, Disney, Paramount and Warner Bros publicly withdrew their usual official revenue reports out of respect for the victims and their families, but sources gave details of the takings to media outlets. Last week’s number one, Ice Age: Continental Drift, dropped to second place, with The Amazing Spider-Man in third. Seth MacFarlane’s R-rated comedy Ted, starring Mark Wahlberg opposite a foul-mouthed CGI teddy bear, is in fourth spot, while Disney animation Brave is at number five.